A textile designer in Bangladesh usually attends lectures and work in studios so that he or she can create the designs on weaving or printing equipment. Also, those who tend to be textile designers they study trends as well as learn about marketability. And during their course of study, some students may participate in professional internships. In addition, textile designers are professionals who not only create but they also design the textile that is used as a product, for making apparels, and many other products like shoes, bracelets etc. As in the former, the functional value of the product is focused on than just the aesthetics; it’s very different from fashion designing. This is because textile designers are into designing of the fabric, yarns by different processes like weaving and knitting etc. For the ever-changing fashion business, a textile designer in Bangladesh provides value to multiple areas. Because, they are employed in the capacities of designers, colorists, trend analysts and stylists in design studios, the program prepares students for a wide range of careers in textile mills and export houses. Also, as designers or entrepreneurs, there is a chance to work with fashion designer, design studios, buying a house, handloom cooperatives and buying agencies as design or fabric managers, or work independently. Moreover, as the fashion industry is a booming every day, every now and then a new trend gets picked up. This is why the fashion industry is the lifeline of many humans around the world. And there are a lot of textile industries across the country, which is the largest aspect t become a textile designer in Bangladesh. 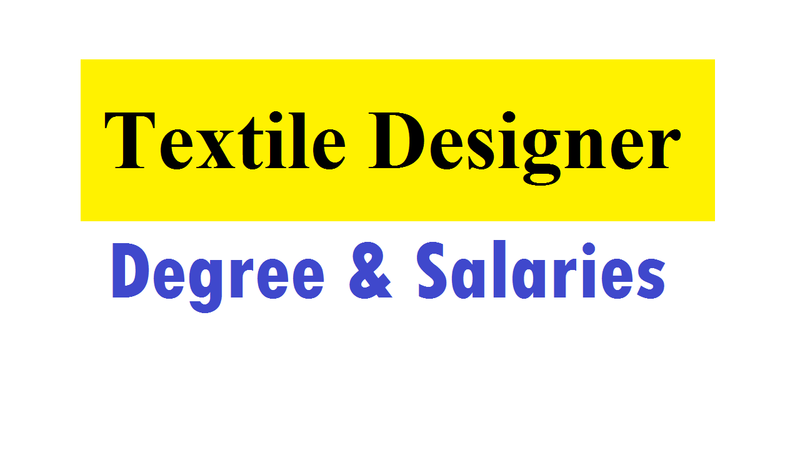 If you like to become a textile designer in Bangladesh then you should have a bachelor’s degree either in a Bachelor of Fine Arts, a Bachelor of Arts in Design or a Bachelor of Arts in Textile Design. While learning about the properties of different yarns, fibers, dyes, and fabrics students explore the basics of color, texture, and form in a textile design degree program. On the other hand, a textile designer in Bangladesh is paid as per the market standards, which is the salary range for fresher is BDT10, 000 to BDT20, 000 per month. As these salary digits keep increasing as they having work experience with the passage of time, an experienced candidate can expect a salary in the range of BDT20, 000 to BDT40, 000 per month. If mere passion for fabric and everything that feel right in that zone then the first thing you need to check off the list. Also, you need to have an intuition with what color goes with what shape and the texture of the fabric or yarn as well despite having a creative outlook on things. As you spend more time on fabrics and learning on how to understand them, you need to develop it. You need to follow the following steps which are pretty important unless you are a prodigy in the fabric designing zone and have connections in the industry in terms of academics. So, let’s know how to become a textile designer in Bangladesh. If you want to obtain a position as a textile designer in Bangladesh then you need a bachelor’s degree in textile design, graphic design, or a fashion-related field. You’ll find a lot of colleges and universities that are both private and public offer bachelor’s degrees in textile design. Along with knitwear, surface, and woven design, computer design software, and design history, bachelor’s degree programs cover a wide range of topics. After completing your bachelor’s degree in textile designing, an internship in textile design can provide hands-on experience along with on-the-job training to those looking to enter the field. As interns can also learn more about specific industries, it can help students focus on a specialty within the textile design industry. So, you have to seek for an internship project and there are some colleges and vocational schools offer internship assistance to their students. Also, you should get involved with student associations because some schools offer student clubs for individuals studying textile design. It’s a great way to collaborate on projects, exchange ideas, and network with other students while participating in club activities. If you’re a textile designer in Bangladesh then you must be creative and detail oriented. Also, you should possess the ability to work collaboratively along with meet deadlines and work well under pressure. The industry is in a state of constant change, and textile designers must stay up-to-date with both fabric and fashion trends due to evolving technology. As a designer creates and presents design sketches, you must understand color, fabric, and texture. Also, textile designers should be knowledgeable about relevant software as detailed in job postings. By working as an assistant to a professional designer or applying for an entry-level position at a design firm is one way to break into the textile industry. Also, there are chances for some individuals to get employed when they are in the internship. In this case, you can join a professional organization. If you join a professional organization then it may be beneficial to a designer just starting out in the field. When you’re a member it benefits for you including professional development resources, symposia, and access to publications. Also, it could lead to job opportunities when you’re with these associations. It can help designers advance in their careers and stand out in a challenging job market when they have a master’s degree in textile design.